This week I was editing and testing salad recipes for Almond Accents (I’ll share some new product recipes when they launch this fall), so I was looking for a little protein to go with dinner. I flipped through the July/August issue of Eating Well Magazine, and kept paging back to the Picnic Oven-Fried Chicken. I’m not usually enamored with fried chicken, but have heard for years about my late father in-law’s Chinese fried chicken. You can imagine what I was up against with this healthier version. A real face-off! I was pleasantly surprised, and Bernie was delighted. He thought he deserved an extra piece for the lower calories of this rendition! The recipe calls for a buttermilk-garlic soak, which I only did for 40 minutes; 30 minutes to 8 hours is recommended. 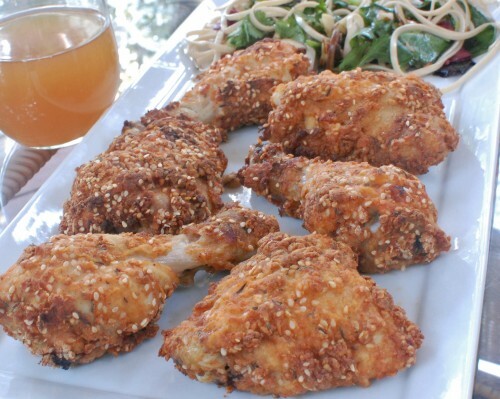 The coating is whole wheat flour and sesame seeds, spiked with paprika and thyme. I truly followed this recipe with the exception (I can’t help it) of using only 2 pounds chicken so there was plenty of coating, and tested brushing with olive oil because I prefer not to use aerosol oil sprays. The difference was minimal, so use the spray if more convenient. With a glass of beer and this Asian Accents Noodle Salad, our summer dinner on the deck was perfect! As mentioned a few posts back, I’ll be reviewing magazine recipes periodically. You can find this recipe at Eating Well by searching www.projectfoodie.com, my favorite recipe search site. Note: I think the chicken is best hot out of the oven, even though they call it picnic chicken. And don’t over-bake. Mine was well-done in 40 minutes. 1) Whisk buttermilk, mustard, garlic and hot sauce in a shallow glass dish until well blended. Add chicken and turn to coat. Cover and marinate in the refrigerator for at least 30 minutes or for up to 8 hours. 2) Preheat oven to 425°F. Line a baking sheet with foil. Set a wire rack on the baking sheet and coat it with cooking spray. 3) Whisk flour, sesame seeds, paprika, thyme, baking powder, salt and pepper in a small bowl. Place the flour mixture in a paper bag or large sealable plastic bag. Shaking off excess marinade, place one or two pieces of chicken at a time in the bag and shake to coat. Shake off excess flour and place the chicken on the prepared rack. (Discard any leftover flour mixture and marinade.) Spray the chicken pieces with cooking spray. 4) Bake the chicken until golden brown and no longer pink in the center, 40 to 50 minutes. I love the idea of soaking the chicken in the buttermilk! This looks like a much healthier approach to a summer classic by baking instead of frying it too. The buttermilk adds to the moistness and is a good carrier for the flavors and coating. It definitely is a guiltless fried chicken! I’m gonna try this Rose Mary. Jay loved his grandma’s fried chicken so we’ll have a face off here too. And I love buttermilk so this will be fun. Thanks! Let me know how your competition goes! One thing I should mention is to not over-bake the chicken and it is probably best warm, even though they say it’s for picnics. You’ve nailed it! Anyone who absolutely loves fried chicken but has always been feeling ‘guilty’ because of health concern, I think this might just be the ‘healthier’ solution. I tried this recipe for my 2 recent picnic lunch and everyone absolutely loved it! Thank you for letting us know! What would be your favorite oven for this chicken?